When choosing upholstery fabric for upholstered furniture the first two things you should consider are how often will the furniture be used and who will be using it. 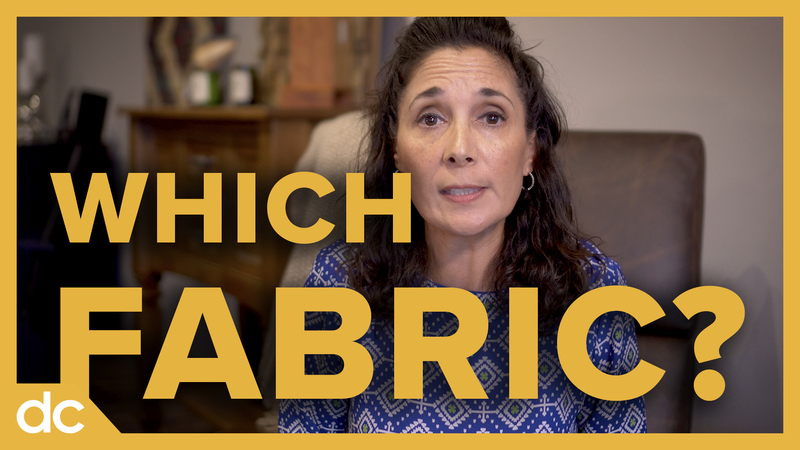 Asking these two questions will help you determine how durable the fabric you choose should be. The durability of upholstery fabric is determined by its double rub count. Fabric with at least a 9,000 doublerub count is suitable for furniture that is not used often. A rub count of at least 15,000 is sufficient for heavy residential use. Less durable fabrics are OK for furniture in low traffic areas. For furniture in high traffic areas like the living room furniture, kitchen furniture, dining room furniture, and spaces where the kids love to play and pets like to roam, choose a more durable fabric. One of the challenges of choosing upholstered furniture at DutchCrafters is that we offer a lot of options. So just what upholstery should you choose? The first things to consider when choosing your upholstery are: What is your furniture going to be used for and who will be using it? If your furniture is only going to get occasional use, you can consider less durable fabrics. If the furniture is going in the living room or at the kitchen bar with steady use by kids, visitors and pets then more durable fabrics are a better choice. The standard measure for fabric durability is the double rub count, which is based on a machine testing for wear. Furniture that sees light use will be safe with as low as a 9000 double rub count. A 15000 double rub count is sufficient for heavy residential use and a 20,000 to 30,000 double rub count is considered very durable. We offer both natural and synthetic fabrics for most products. Synthetic fabrics are manufactured to be lightweight, won’t wrinkle easily, often resist stain and wear, and are fairly easy to clean. Revolution Performance Fabric is an eco friendly synthetic fabric, made with fibers upcycled from a by-product of the petroleum industry. Revolution fabrics are eco friendly, stain resistant, American made and clean easily. They offer good protection for your upholstered furniture and cost less than Crypton fabrics. Crypton fabrics use a chemical treatment built into the fabric to create advanced resistance to stains, moisture, mildew and odors. The barrier created by Crypton means that liquid spills bead up and do not absorb into the fabric. They are easy to clean with most liquid spills blotting off the surface, and Crypton fabrics are Green Guard Certified. And if you love the leather look? Genuine leather offers a classy appearance that’s very durable and easy to clean. Leather ages well and maintains its shape, developing more character and softness over time. It’s important to remember that genuine leather may have imperfections. An animal hide may have marks, wrinkles or scratches present. They are part of what makes the leather authentic. However, you don’t want to position furniture with leather upholstery in direct sunlight due to the possibility of the light and heat causing the leather to dry and crack. Ultra-leather, by contrast, is not genuine leather, but a high end faux leather that’s highly durable and offers a genuine leather look and feel. It’s eco-friendly with Green Guard Certification and does little if any chemical off-gassing. Performance grade faux leather is made for a consistent, attractive appearance and resistance to wear at a more affordable price. Outdoor Sunbrella fabrics are fade and water resistant and easy to maintain. They come in many colors and patterns and can be used on indoor furniture as well! Visit our Sample Kits page to select fabric samples and we will mail them to you. Or, simply email or call a Furniture Specialist for assistance picking a fabric type, finding a good color match, or ordering samples.